It is estimated that one in three people will be diagnosed with cancer during their lifetime (source: CancerStats, CRUK). The strongest risk factor for cancer is age, with 75% of cases diagnosed in people aged 60 and over. Population aging in the developed world represents an ever increasing burden to our health system. However, emergent therapies have improved ability to fight cancer. This has come substantially from our ever increasing knowledge of the causes underlying tumorigenesis. Our challenge now lies in understanding the molecular mechanisms responsible for aging in order to identify new ways of reducing the lifetime risk for cancer (and remaining age-associated diseases) leading to a prolonged healthier life. 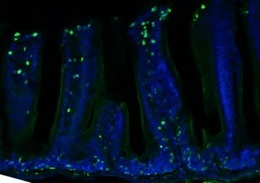 Telomeres, the natural chromosome ends of eukaryotes, have unique properties that distinguish them from damage-induced DNA ends. 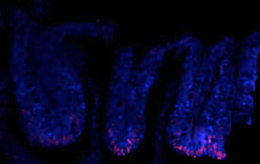 Most human somatic cells lack telomerase, the enzyme responsible for generating telomeres. Continuous proliferation of cells lacking telomerase throughout our lives leads to telomere depletion and ultimately to telomere loss. When telomere function is lost, chromosome ends are treated as deleterious DNA double strand breaks that, in most cases, result in cell death. If, however, these cells survive, chromosomes will be joined by their ends yielding dicentric entities that can break upon mitosis. This so-called ‘break-fusion-bridge’ cycle, is responsible for unequal distribution of genetic information to daughter cells as well as to the formation of new unprotected ends. The ensuing genetic disarray is thought to be the major contributor for genomic instability - a characteristic shared by most cancers. This constitutes our current model for tumorigenesis and basis for the causal association between aging and cancer. Welcome to our lab’s web site! If you are interested in telomeres, cancer and aging, you are visiting the right lab. If you are a motivated scientist and would like to work in a dynamic and multidisciplinary environment on Europe’s west coast, we are looking for collaborators. Join us! Here are some pictures of the model systems we use to study telomeres. We use fission yeast to understand the molecular nature of telomere protection (in the top two pictures, the sub-telomeres of chromosome III are stained in green, highlighting a telomere fusion. Red - SPB and blue - DNA). 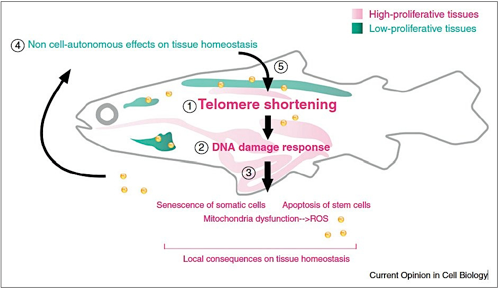 We use zebrafish to study the consequences of telomere dysfunction in cancer and aging (the bottom two pictures show crypts and villi of the intestine with proliferating cells in red and apoptotic cells in green. Blue - DNA). On the top centre, we highlight the role of tissue communication in aging, as described in our recent review in Current Opinion in Cell Biology. We are indebted to all, both public and private, that finance our research. Our goal is to investigate the mechanisms underlying chromosome-end protection and the outcomes of its failure, not only at the cellular level but also at the organism level. Our work will allow the discovery of key regulators guarding cells from genomic instability. Identification of these entities will provide new targets for cancer therapy along with tools for early diagnosis. Ultimately, we aim at preventing of the incidence of cancer associated with aging. We plan to achieve this by identifying and manipulating the agents responsible for its increase.